Unless you live in the Far West neighborhood of Austin, chances are that you’ve never heard of Allen Memorial Park. This hilly little hiking spot is tucked near an office park west of MoPac near Far West. There are no playgrounds or sports fields at Allen Park; its main draw is the well-kept trail, clean picnic areas, and a real sense of seclusion. Nearly a mile of gravel trail twists through the park. Some hills are very steep, while other parts of the trail are relatively flat overlooking the city. Although sounds of MoPac traffic hum throughout the park, a thick layer of foliage helps the trails feel set apart from the surrounding city. My husband and I were the only visitors at the park at dinner time on the Fourth of July. 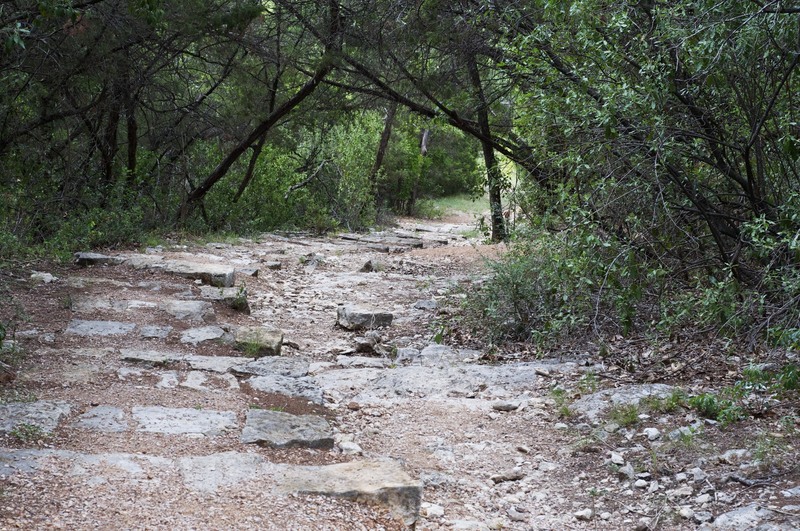 The wide, gravelled trail starts at Allen Park’s parking lot and ascends up a rocky scramble to a large picnic area. 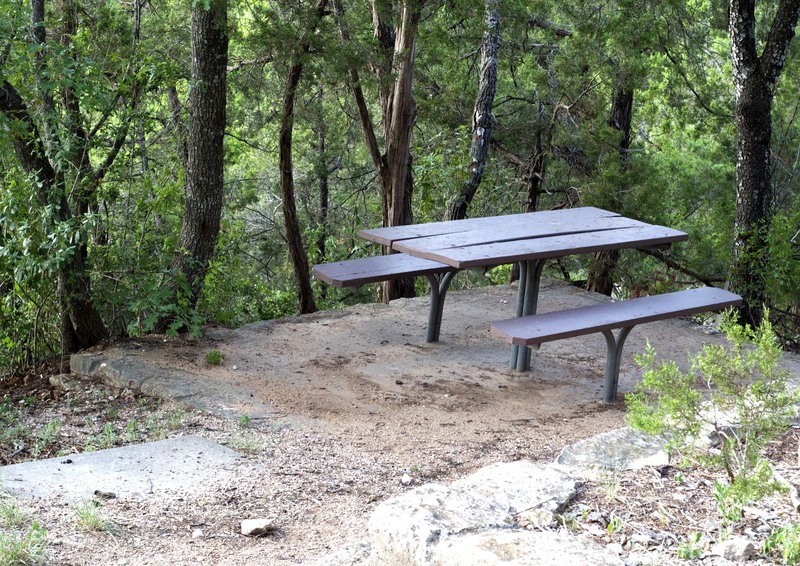 Besides this larger picnic spot, there are at least six separate picnic tables near the entrance of the park. Each table is located in its own paved clearing, and some have a charcoal grill nearby. (As of this post, these grills are covered and unusable because Travis County is under a burn ban.) Although it’s not a long walk from one picnic area to the next, each clearing is separated by dense greenery and windy trails. 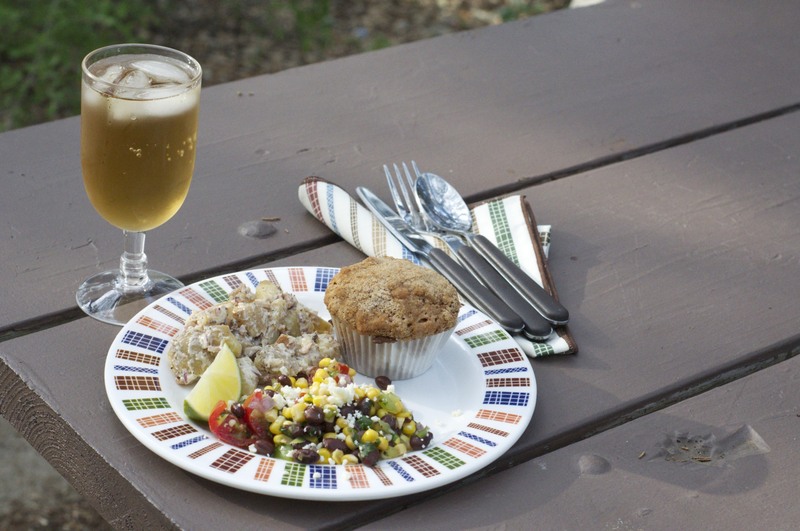 We chose to dine at this picnic table, which overlooks the Northwest Hills neighborhood to the west. For dinner I made some easy summer salads with Local Box ingredients from Hillside Farm, Massey Farm and Tecolote Farm. The highlight of the meal was a spicy corn & black bean salad, studded with Juliet tomatoes and topped with Cotija cheese. The best part of this recipe– besides the tomatoes– is a spicy jalapeno vinaigrette dressing. To get an even level of high heat throughout the salad, I use a blender to liquify a whole jalapeno pepper and a clove of garlic into the dressing. This technique ensures a high level of heat without worrying about whole jalapeno seeds creating “hot spots” throughout the salad. I also don’t have to bother with wearing gloves as I mince the pepper by hand– a huge plus. Fill a medium saucepan with a few inches of water and bring water to a boil over medium heat. Meanwhile, remove the shucks and silks from the ears of corn. Wash and dry the corn, then cut the kernels off of the cob. Cook the kernels of corn for about three minutes in boiling water, until they are tender-firm. Drain the corn and set aside to cool. Peel and dice the onion. Remove the ribs and seeds from the bell pepper, and dice the remaining flesh. Slice Juliet tomatoes in half. Place them in a large salad bowl along with the minced onion, bell pepper and sliced tomatoes. Chop off the tough stems from the bunch of cilantro. Chop the remaining leaves and add to the salad, stirring to combine. To make the dressing, peel the garlic and slice the top stem off of the jalapeno pepper. Put the whole garlic clove and decapitated pepper– seeds, ribs and all– into the blender along with the remaining ingredients. Pulse on “liquify,” or your blender’s highest speed, for about three minutes, until all the pepper seeds have been obliterated and the dressing is emulsified. No blender? Peel and crush the garlic with a garlic press. Remove the stem, ribs and seeds from the jalapeno and mince it by hand. Whisk the crushed garlic and minced pepper together with the remaining ingredients in a small bowl. Pour the prepared dressing over the salad and mix well. Top with crumbled Cotija cheese and garnish with lime wedges before serving. This salad keeps well in the refrigerator and tastes better the second day, although the tomatoes will not be as vibrant red by then. Peaches AND blackberries in the same box? I think it’s safe to say that summer has really arrived! Peach-blackberry compote with basil syrup – An awesome summer dessert. Corn and carrot salad with golden raisins – This is going to be a great side dish for something grilled. Ginger chicken Romaine wraps – Add some sliced basil to these. Chilled beet and onion salad – Add some sliced radishes to this to add a little bite. Can you believe Thanksgiving is next week? I’ll come up with some T-giving-appropriate recipes using Local Box ingredients in this and next week’s posts. Apple-persimmon cake – This would be a great Thanksgiving dessert. It’s vegan, too! Tsimmes with beets, turnips, and beef – Tsimmes isn’t plural for anything, in case you were wondering – it’s a traditional Ashkenazi Jewish stew. I’ll use fewer carrots and more turnips here (or maybe even all turnips and no carrots, but I’m not sure it would still be a tsimmes at that point). You won’t use all of your beets in this recipe, so roast and peel the rest to use in salads during the week. Butternut squash with ginger and cilantro – Would be a great Thanksgiving side dish. I love the addition of a little crystallized ginger, which you can usually find in the baking aisle. 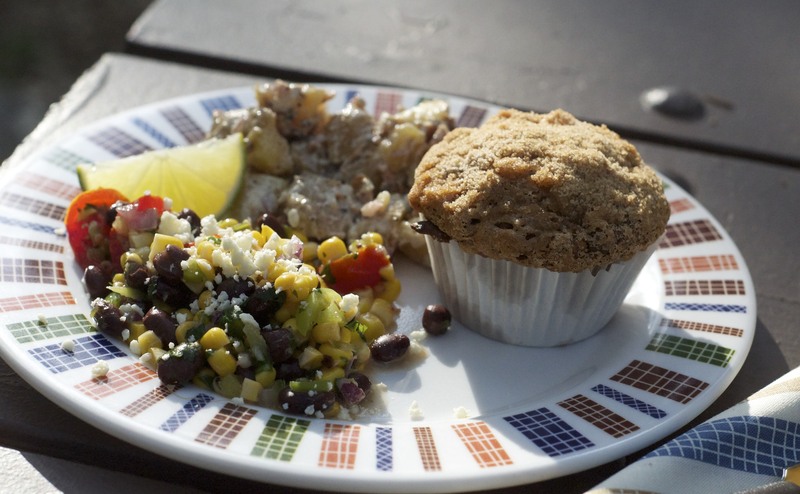 Chipotle turkey cutlets with charred corn salsa – Ok, this may be better as a post-Thanksgiving way to use up leftover turkey, but you can just use chicken instead if you want. With the dog days of summer comes a ton of okra. I’ll admit that it’s not my favorite vegetable because of the slimy substance inside the pods, but if cooked properly, you can get rid of much, if not all, of the sliminess. I love fried and pickled okra, but sometimes you need something that takes less time and, in the case of fried okra, is more healthy than that. This saute uses lots of fresh summer veggies, enhanced by lime juice and cilantro. The trick to ridding the okra of sliminess is to cook it long enough so that it browns and gets a bit of crunch. The acidity of lime juice also helps. Use any combo of summer veggies here; just make sure the pieces are cut to approximately the same size so that everything cooks evenly. Heat olive oil over medium-high heat. Add okra and saute about 8 minutes, until it starts to brown. Add remaining vegetables, lime juice, and salt and cook another 10-12 minutes, stirring often, until veggies are tender. Stir in cilantro. Peach-basil sangria – I imagine you can replace with wine with Sprite or club soda for a non-alcoholic drink. Blueberry overnight oats for breakfast – Overnight oats are awesome – no cooking required!. Just mix equal parts regular rolled oats, milk (I use almond milk) and yogurt (I use vanilla) and let sit in the fridge overnight. In the morning, add some berries and zap in the microwave for 30 seconds, just to take the chill out. Yum. Vegetable-beef soup – Sub your fresh corn and green beans for the canned and frozen ones in the recipe, and add a few handfuls of chopped chard. As for the carrots, I’m just going to roast and chill them to toss in salads throughout the week. Sauteed Swiss chard and corn — It’s hard to find lemon thyme, so just use regular thyme instead. Italian Wedding Soup — Garnished with chopped parsley.